Everything was ok despite the fact, that the kitchen was promissed. Actually it was one cooking stove under the roof with no walls. Campingi was overcowded in the weekend so I'd recommend to go there on working days if possible. 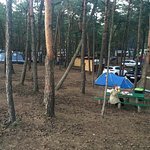 Get quick answers from Camping STOGI no. 218 staff and past guests. "They are huts in a forest near a beach ,it doesn't matter which one lol"